The Same Processor Used In Macintosh II Personal Computers Is Still Going Strong In Which Fighter Jet? Which One Of These Iconic Novels Sold Less Than A Few Dozen Copies A Year For Decades After Publication? Released in 1987, the Apple Macintosh II featured a then-quite-powerful 16 Mhz Motorola 68020 processor. Although the processor was replaced fairly quickly with the release of the Macintosh IIx in 1988 (and disappeared altogether when the original Macintosh II was discontinued in 1990), well-designed chips never die; they just find a new purpose in life. In that regard the Motorola 68020 wasn’t sent to the CPU graveyard, it was just repurposed (and readily so on account of its falling cost and high reliability) for other tasks. 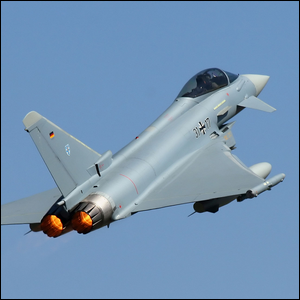 While it is no longer used in personal computers, one of the places the old 68020 found a new lease on life in was the avionic and navigation systems of the Eurofighter Typhoon fighter jet, used by the air forces of Britain, Germany, Italy, and Spain. Image courtesy of Krasimir Grozev.